﻿Case I A blue rectangle is inscribed in a green square. Drag the GOLD dot. Can you explain the shape of the curves in the right panel? What fraction of the area of the green square is occupied by the blue rectangle? ﻿ Can you write an expression for ratio of the areas as a function of the position of the GOLD dot? 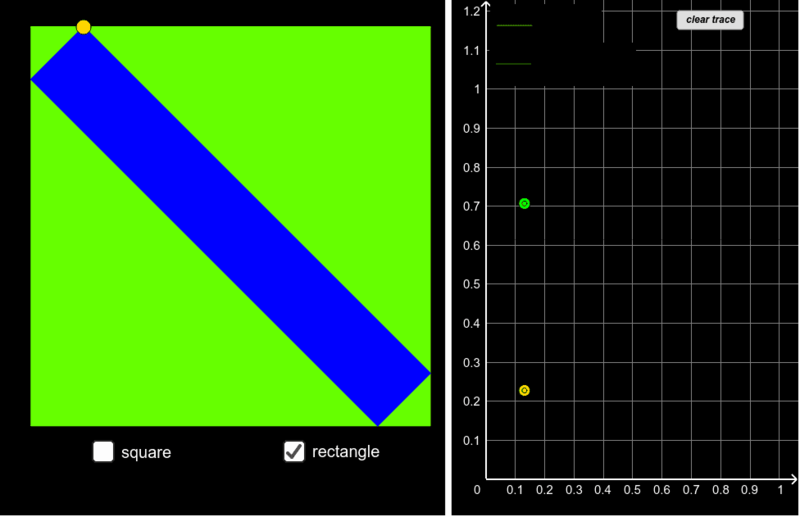 What fraction of the perimeter of the green square is the perimeter of the blue rectangle? ﻿ Can you write an expression for ratio of the perimeters as a function of the position of the GOLD dot? ﻿ ﻿Case II A blue square is inscribed in a green square. Drag the GOLD dot. Can you explain the shape of the curves in the right panel ? What fraction of the area of the green square is occupied by the blue square? ﻿ Can you write an expression for ratio of the areas as a function of the position of the GOLD dot? What fraction of the perimeter of the green square is the perimeter of the blue square? ﻿ ﻿Can you write an expression for ratio of the perimeters as a function of the position of the GOLD dot? What questions could / would you put to your students based on this applet ?